The scenery and landmarks are the real heads up display. Without looking at my map, I know exactly how to get from Cierzo to the Enmerkar Forest. Straight out the gates, right at the fork (bandit camp to the left), steady on at the next fork, left at the foot of the Conflux mountain, follow the road southeast past the Vigil Pylon, then the southeast-most exit on the left before reaching the shipwreck. I swear I dictated that all without checking the map. In any other RPG I would struggle to perform the same basic task with a shred of the same certainty. Not without flicking my map open for a split second at every fork in the road just to make sure I'm not remembering incorrectly. 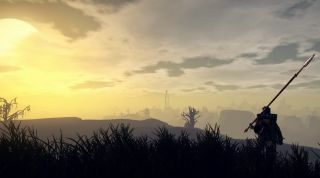 Outward has already raked in praise for the sense of exploration it inspires. Despite that, it lacks a few things that most games about exploring huge open worlds count as givens. Outward's map doesn't have a handy player marker showing my location that I can obsessively check. It doesn't have a minimap, either. I've never been so happy about a missing feature in an RPG. In fact I don't miss it at all. Reliable, detailed maps are a scourge on open world games. In Skyrim or The Witcher 3 or Dragon Age: Inquisition I succumb to the impulse of checking my map about as often as I check my phone during dinner. I couldn't get you from Whiterun to Windhelm by memory if Lydia's life depended on it. Outward broke me of that habit quickly. Without a minimap to watch like a hawk, I initially relied on the main map. With no icon showing my current location, Outward's regional maps function more like tests than answer keys. They're suggestions at best and red herrings at worst. Case in point: the first patch notes for Outward mention moving the map marker for a bandit camp in Chersonese to accurately reflect its actual location. During my first ten hours, I was prone to pulling my map out if I felt particularly disoriented, but now I can typically get from point A to point B on memory alone. Instead of keeping my eyes glued the top right corner of my screen, I take a quick study of my map when I leave town and then watch for landmarks in my surroundings. We’ve already heaped praise upon Outward for presenting us with the challenge of actually starting at the bottom of the food chain, but its greatest success has been in forcing me to give up my most embarrassing weakness. I’m not blessed with the ability to slay monsters simply by virtue of being the protagonist. I’m not given the gift of magic just for being born. And if I want to safely navigate the world, I have to drag my eyes away from the map and actually learn to recognize my surroundings. At the risk of sounding like a grumpy old gamer, RPG maps have made me lazy. They're meant to be helpful, bringing order to vast worlds. More often than not, they shrink the world around me to the size of a compass and all the hard work of environment artists flies right under my nose. I can't begin to count the number of times I've noticed something new in a game that I've walked past a dozen times. In Outward, the little details are burned into my memory. While playing co-op online with a friend, we were walking the route from Cierzo to the Enmerkar Forest. He sprinted up to the cart and tent near a fork in the road on the east side of the Conflux Mountain, asking "Is that a building? I wonder what's in it." I immediately remembered. "A dead guy." I answered. It's not the greatest feat of memory, but that cart and tent are a landmark that I know my way by. In another game, I'd have easily confused that same location with another and pulled up my map to verify where I was actually standing. Aside from checking the position of a location I haven't explored yet, I've given up Outward's map entirely. When waking up from a defeat scenario, I'm able to stand up and use the distant, hazy Vigil Pylon on the horizon as my compass. When playing with a friend who asks, "Are we going the right way?" I can confidently answer yes. Outward's landscape is full of color and detail that I know I'd have missed if it allowed me to rely more on a map marker than actual landmarks. And there's one more benefit—bandits can't sneak up on me since my nose isn't always buried in a map.